“I see the government’s talking about introducing fast-track justice,” said OldSmoothie today. “Fast-track injustice more like,” said BusyBody. “Yes, in my experience speedy justice is a contradiction in terms,” said HeadofChambers. “And has nothing to do with billing out more legal fees,” said TheVamp. “Or making defendants sweat and encouraging them to plead guilty,” said Teflon. 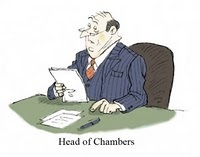 “Oh, how very cynical for ones so young,” said HeadofChambers. “It’s the suggestion for weekend and evening courts that annoy me,” said UpTights. “I already use the evenings and weekends to prepare my cases and to do advices and other paper work,” said Teflon. “Ah, whatever happened to those predictions that work would be done by machines and we’d all be sunning ourselves with too much leisure time?” said HeadofChambers.